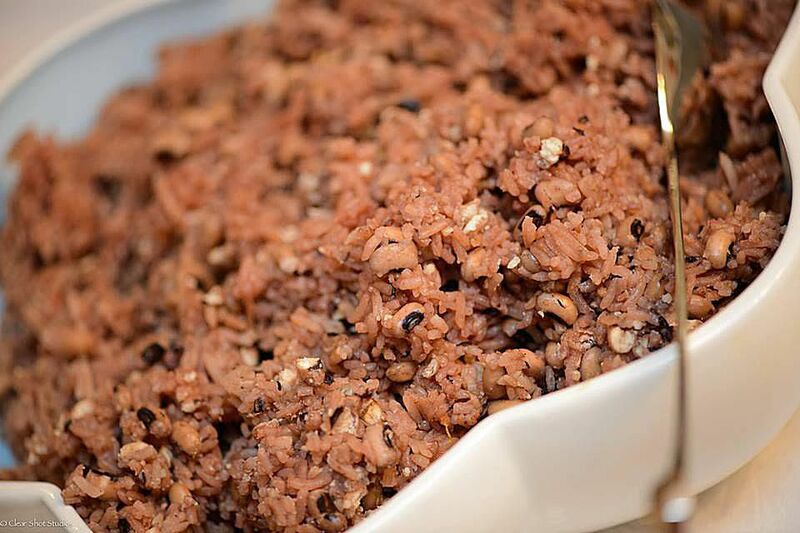 If you have ever wondered about the connection between West African and Caribbean cuisine, we would recommend you look no further than the rice dish, waakye (pronounced waa-che!) This is similar to Jamaican rice and peas or cook up rice from Guyana, in fact, these dishes were derived from waakye, possibly after the transatlantic slave trade. It gives an idea of how authentic this dish is in African cuisine, but with the arrival of the Portuguese to West Africa between 1400 and 1600, it is still questionable whether authentic waakye is an adulterated version of a purer form of the West African dish. In the Caribbean version of rice and peas, thyme, scotch bonnet pepper, onions and coconut milk are incorporated into the dish. These two dishes appear almost exactly the same except for the distinctively deep reddish brown hue which is characteristic of waakye. A traditional waakye, much like rice and peas, is almost always made with black-eyed peas or cowpeas. It's traditionally boiled with dried red sorghum leaves and an effervescent additive known as kanwa, a type of naturally occurring sodium based salt. Some people refer to the leaves as millet leaves or simply waakye leaves, so we cannot be 100% sure about what the leaves actually are. If in doubt, just ask for waakye leaves when you are looking for them at your local West African food market. To fully appreciate the fullness of flavor of waakye, it is important to get acquainted with the accompaniments normally served with waakye. As a popular street food, it is served traditionally in a banana leaf with weley (cow skin) stew, boiled eggs, shito and taalia (spaghetti). The best-tasting waakye you will ever eat can only be bought on the streets of Ghana.